I found this coupon on Save.ca’s website on their coupon page. This is a Glade coupon that can be mailed or you can print it yourself as well. I usually prefer the mail option because for me the print doesn’t always work. Create an account at save.ca, select either to print or mail the coupon. If you mail the coupon it will take about 2-3 weeks and it’s totally free. 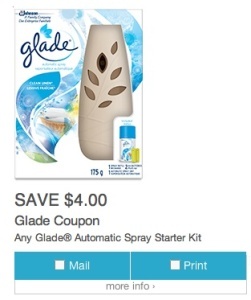 Glade coupon is to Save $4 on any Glade Automatic Spray Starter Kit. 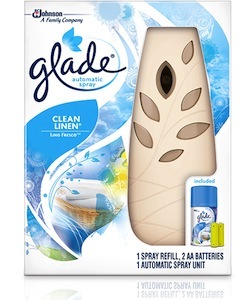 Glade coupon is valid in any store in Canada. You can use the printed or mailed coupon in any grocery store such as Loblaws, Metro, No Frills, Walmart, and others. The Glade® Automatic Spray is a battery-operated unit that time-releases fragrance automatically, while a boost button provides more control with an instant burst of fragrance – and when it comes to certain rooms in our home, that’s called peace of mind. The Glade starter kit comes with the Glade Automatica spray unit, 1 spray refill and 2 AA Batteries.